Many options are available, and they are tailored to your specific requirements. If you need a replacement tooth while the implants are healing, temporary removable teeth or a temporary bridge can be made. 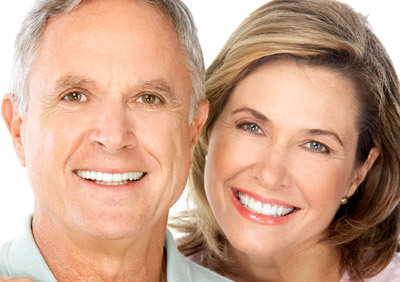 If all of your teeth are missing, an existing denture can be modified to fit during the healing process or a new temporary denture can be made. If you would prefer non-removable teeth during the healing phase, temporary transitional implants usually can be placed along with the permanent implants, and temporary teeth may be made and inserted the same day. Depending on your particular situation, some implants can be placed and “loaded” immediately. This means a temporary or permanent replacement tooth can be placed on, or shortly after, the day the implant is placed. Your restorative treatment begins with specialized impressions that are used to create a replica of your mouth and implants. With this information, the abutments (support posts) that attach your replacement teeth to your implants will be made. Various types of abutments exist. Frequently, “off the shelf” abutments can be used. Other times, custom abutments must be made of gold or a tooth-colored ceramic material. As you can imagine, these custom made abutments add to the cost and treatment time involved. Which abutment to use is a decision that often cannot be made until after healing is complete and impressions have been made. Your restorative dentist or prosthodontist will manage this portion of your care and can provide more specific information if needed. Usually, a surgeon places the implant(s) and performs other necessary surgical procedures – your general dentist or prosthodontist provides the permanent replacement teeth. Both doctors are involved in planning your treatment. Also, depending upon a variety of factors, different specialists may help with your care. Before treatment begins, every effort will be made to give you an accurate estimate of all the expenses involved in placing the implants and making your replacement teeth. Each patient is unique, and it is not possible for us to discuss every option and every contingency for treatment outcome. This booklet is intended to help you understand the general treatment options available to you. If your specific treatment options are not clear, please contact us. We will be happy to answer any questions you have about your care.